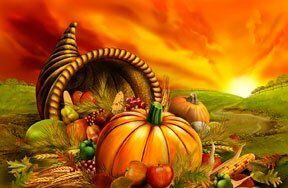 Thanksgiving is a time to celebrate all the things you have, the friends and family that surround you and the feast that lies before you. It’s also a great time to stuff your face. 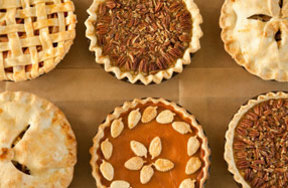 So to stuff your face with some festive class, get crafting with these quick Thanksgiving ideas. 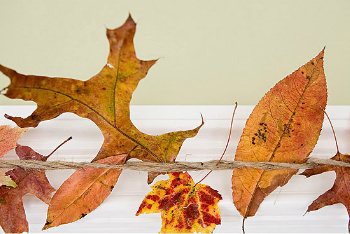 A wonderful way to dress up the dining room for Thanksgiving, this Leaf Garland will bring the beauty of the outdoors in, but you won’t have to worry about the food getting cold. Measure three strands of the twine to the length you want it. 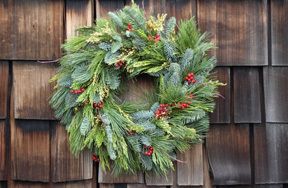 Think of the doorway or room where you’ll be hanging it. Knot one end of the three pieces of twine and braid them together. Doesn’t have to be a tight braid, but not too loose. Tie the other end off. Tuck the stems of the leaves into the creases of the braid you made. If they have trouble staying, a dab of glue here or there might help. Thumbtack the knotted ends to the surface you want to decorate and leaves abound! 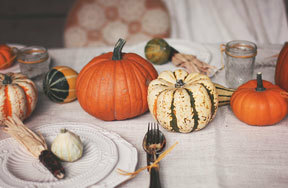 One of the most important decoration grounds of the Thanksgiving feast is the table. You can’t have too many things though, because there has to be amble room for platters and dishes and plates of delicious food. 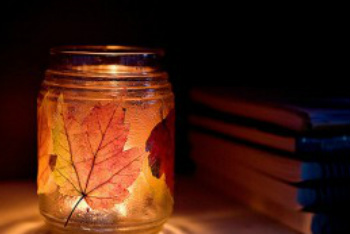 This simple craft will bring some decorative light to the table without sacrificing space. Make sure the glass you have is clean. Glue the leaves to the outside service. Don’t cover the entire glass, but arrange them so you can see the leave shape. Take the brush and coat the outside surface and leaves with a thin coat of glue. Coat again until you like the amount of finish over the leaves. Put your candle inside and light it! So dinner’s ready, the table looks beautiful with its candles and leaf jars, the dining room is strewn with fall leaves, but where do you sit? Easy, read the lovely place setting you made. Cut a 4” by 1” strip of the cardstock or construction paper. Glue the two ends together to make a ring- this is where your pinecone will sit. 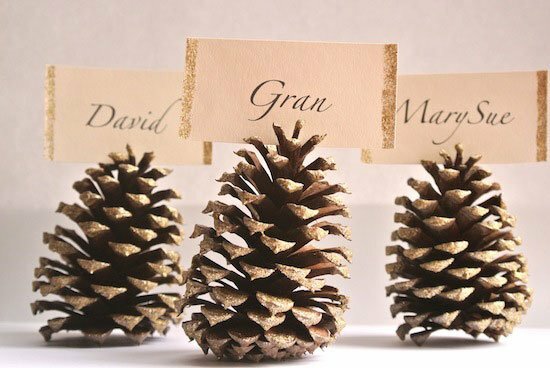 On another slip of paper (size will depend on the size of the pinecone) decorate it with the names of the dinner guests. Add drawings, stickers, glitter- whatever you like. Dab some glue on the back of the nametag and glue it to the pinecone, make sure it’s in a position where you can read it. Enjoy dinner in your well marked seat! How do you celebrate Thanksgiving? Share your stories in the comment's section below! 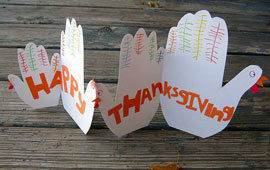 What's the Best Thanksgiving Turkey Craft You've Seen? Handprint Turkey- it's a classic. Candy turkey- better than the real thing.